Vice-Rector of NOVA received today the annual "Female Personalities" LUX Award in the Business category. Professor Elvira Fortunato, Vice-Rector of NOVA, received today the "Female Personalities" LUX Award in the Business category. Lux magazine revealed this week the winners of this prize in all categories. This initiative, which has been repeating for 15 years, counted this year with more than two hundred thousand phone and online votes. The awards ceremony was held today, at lunchtime, at the Hotel Cascais Miragem. 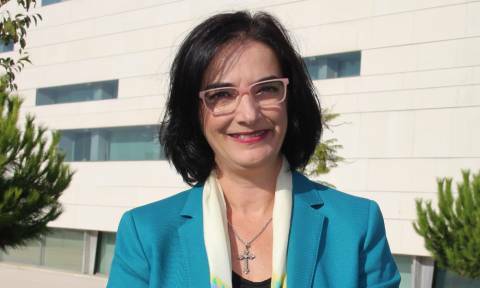 Elvira Fortunato, Vice-Rector of NOVA, is a full professor at the Department of Materials Science at FCT NOVA, Fellow of the Portuguese Academy of Engineering since 2009 and has been awarded the rank of Grand Officer of the Order of Prince Henry the Navigator, by the President of the Republic in 2010, due to her scientific achievements around the world. She is the director of the Institute of Nanomaterials, Nanofabrication and Nanomodeling and of CENIMAT. The Professor was a pioneer in European research on transparent electronics, namely thin film transistors based on oxide semiconductors. She has already been awarded two Advanced Grants by the European Research Council (ERC), one in 2008 and another in 2018. The latter, in the amount of 3.5 M €, was the largest grant ever awarded to a Portuguese researcher and also the highest awarded by the ERC in this Call to which more than 2160 researchers worldwide applied. With more than 500 scientific publications, Elvira Fortunato has received more than 18 international awards and distinctions over the last 10 years for her work (the Blaise Pascal Medal of the European Academy of Sciences (2016), IDTechEx USA 2009 (paper transistor) European Commission for Women's Innovation, Finland 2011, among others). Since November 2016, she has been a member of the High-Level Group for the European Commission's Scientific Advisory Mechanism.